A intense angling season for whitefish starts on the coast when ice melts and lasts only for few weeks. Shoals of whitefish are swimming and searching for aquatic worms near the shores. Angling for whitefish is easy and enjoyable. You need only simple tackle. Typical set is rod, reel, line, sinker and a hook with worm. Just cast the line in the water and wait. 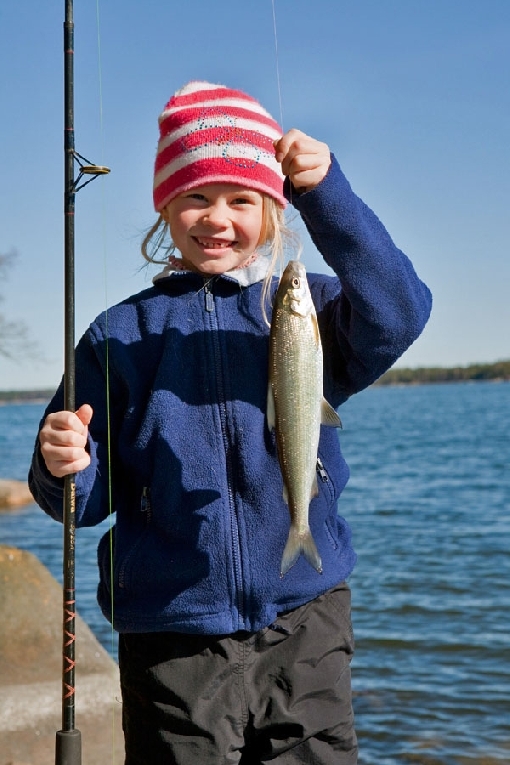 Typical size of whitefish weighs from couple of hundred grams to one kilo, but lucky angler may also catch two kilo whitefish. The best season is soon over when waters are warming up. After that anglers are getting more an more perch and cyprinids. Streaming sounds where bottom is gravel, shores of islands and bay areas where water temperature is warmer than elsewhere, are good spots. Photo above: Tapio Gustafsson. “Happy whitefish angler”.